Electricity generating renewable energy technologies have been sold as financial investments as much as energy saving products since the Feed in Tariff was launched in the UK. These financial returns can be very sensitive to assumptions about the future of electricity costs. The Department of Energy and Climate Change (DECC) has revealed that its own modelling is based on an assumed of electricity cost inflation of 2.6% a year over and above general price inflation (this figure is called the real rate of inflation). Responsible industry bodies such as the Solar Trade Association have used this rate of inflation for calculating the financial returns from solar photovoltaic systems. In 2014 a range of renewable heat generating technologies such as heat pumps, wood pellet stoves and solar heating panels will benefit from a ‘Feed-in tariff for heat’ called the domestic Renewable Heat Incentive. In presenting the financial case for these technologies, industry will need credible assumptions of future costs for domestic gas and heating oil as well as electricity. Where has the 2.6% figure come from for electricity? What are the equivalent values for heating oil and for gas? DECC publishes data collected by the Office for National Statistics in compiling the Consumer Prices Index (CPI). 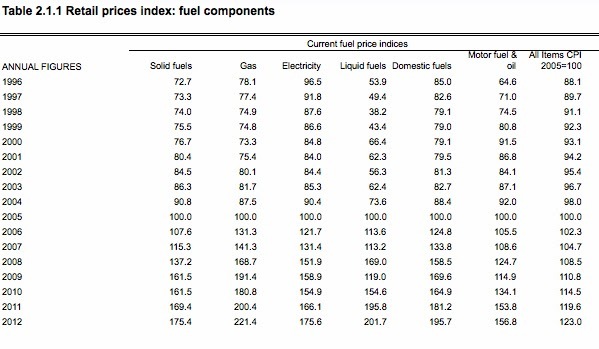 The table below shows prices of various fuels for the most recently published data range that covers the fourteen years from 1998 to 2012. The chart at the top of the page shows the prices from the table rebased to set prices in 1998 to 100. General inflation increased costs by 37% over the whole for the fourteen-year period. 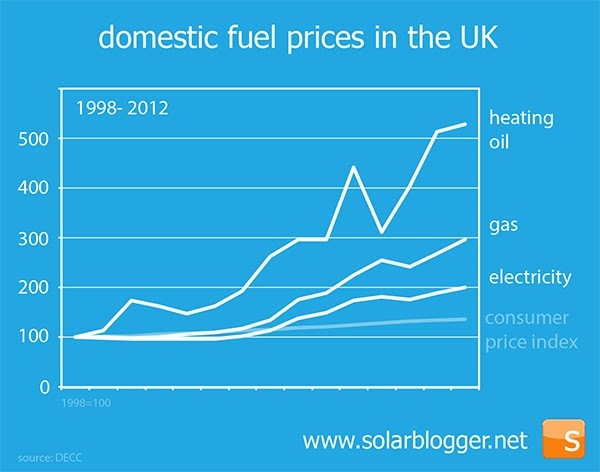 It can be seen that all energy costs have risen by much more. Electricity has risen by 100% in the same time, gas by 195% and heating oil by 428%. What can also be seen is that prices have not risen steadily. Fuel oil prices in particular are volatile with prices falling back before rising steeply again. Any measure of fuel inflation is therefore very sensitive to the choice of start and finish date of the period considered, a fact that can be used by those who want to present a biased picture. 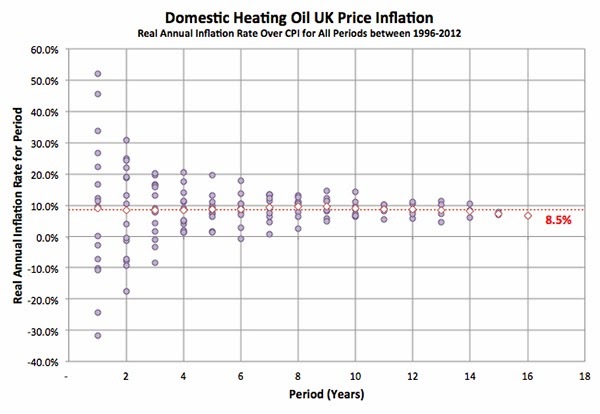 For example choosing a period from 2000 to 2009 produces a real inflation rate of 4.7% a year for heating oil, whereas selecting 1998 to 2008 yields an eye-watering 14.3%. 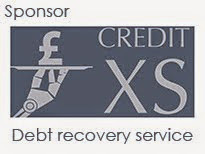 If our goal is to assess an unbiased and justifiable inflation rate for industry to use to present financial to potential customers, then we need to make sure that we're not open to such criticism. I calculated the real rate of inflation for each and every start and finish date possible in the data set. 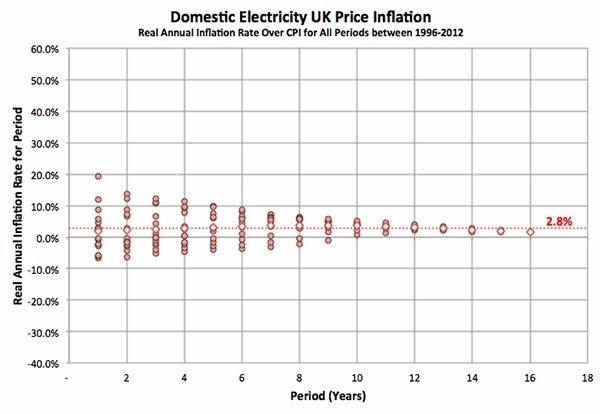 The chart below shows the resulting rates of real annual inflation plotted against the length of the period for domestic electricity prices. Predictably, the shorter the period considered the wider the range of results, which narrow as the period covered lengthens. Also shown on the plot is the average for each period length (diamond shape). The best fit line for the averages is a real rate of inflation of 2.8%, an identical figure to that used by DECC for forecasting future price changes of electricity. The analysis was repeated to produce a real rate of inflation of 5.8% for gas and 8.5% for heating oil. Excellent informtive peice of work Stuart. Same trends in Australia as in the UK. Both countries facing opposition from fossil fuel driven energy companies. Good article and excellent graphs! 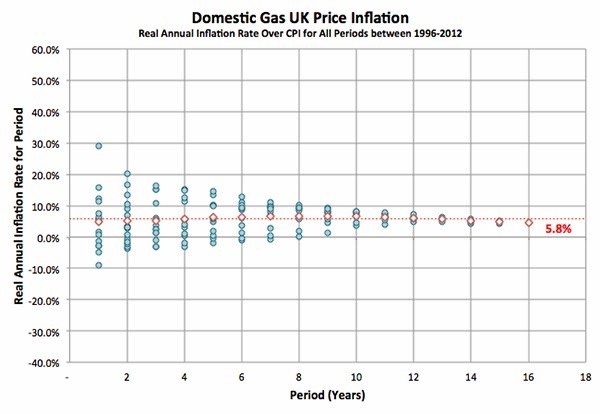 Could you point me towards a document of DECC's that uses the 2.6% inflation rate please? I'd like to refer to it in my studies. Very informative information and has saved me a lot of time. A thought provoking read Stuart. In general Electricity is generated from other fuels so I'm not sure why it's price does not trend to that of it's source fuel mix. Either way renewables will help offset the high cost of Gas and Oil in Electricity pricing. There's a couple of aspects to consider. First, electricity is made from a range of fuels including renewables (now 15% and rising), and nuclear (around 20% and falling). So around 35% of the electricity is not made from oil or gas. Second the system has a natural resilience to switch from one fuel to another as prices fluctuate. If coal prices fall (as they have recently due to shale gas in the USA depressing demand in the US for coal), then the system switches to producing a greater proportion of the mix from coal, and less from more pricey carbon fuels. Third, the fuel cost is only a part of the total electricity cost, which must include transmission but also amortisation of massive investments in plant and equipment at the power station. These factors combine so that a change in gas or oil prices makes a proportionally smaller change in electricity prices. Excellent work Stuart. Clear, logical and accessible. Compare electricity prices and get the best electric rates available for your home. We compare all electricity suppliers. Get a cheap electricity quote in minutes.